In 2014, Australian artist Orly Faya was asked to paint a human model, so that she “disappeared” into a mural of sea turtles. Despite having no experience with body painting, Faya agreed, and unknowingly opened the door to an artistic practice that would soon become her livelihood. You call yourself a “creative activist” and not an artist. Why? My creative expressions are all within the realms of sending out important messages. The state of the world is central to my purpose for living, and so everything I do relates to the big picture, to support the movement of consciousness towards a more aligned state of being in harmony with the biosphere. What is the purpose and process of Merging? Mergings are ceremonial art immersion sessions that allow people to connect with their true nature through the earth itself. These ceremonies highlight our “metaphoric” and “metaphysic” existence in this world. Through intention, stamina, paint, and photography, we harness the energy of unity by embodying our connection to nature through this creative process. The painting itself takes approximately 1-2 hours, depending upon the needs of the people who are merging. I jump back and forth from one point of perspective and paint what I see until they are completely disappeared. People can go into and out of various realms, experiencing physical sensations that can even cause them to have to sit down at times. We work through all sensations with trust and focus on the goal. Upon completion of the painting I take photos of the final product. When all is complete, we rest, drink tea, and if there is a body of water close by, I invite my clients to submerge as a natural way of rebirthing and cleansing. Paints are all non-toxic and non disruptive to the nature. One of Faya's Mergings, which depicts a couple kissing against a wooded landscape. What indigenous practices do you employ in your work? During [the] ceremony prior to painting, we bring in elements of significance: symbols, things, letters, words to declare into existence and which to let go of. I use various traditions, such as smoke ceremony, using herbs such as sage and wood such as palo santo. This is sometimes known as smudging, and is a way of cleaning the energy of the person and the space. Another process we honour is ceremonial use of aqua de flores, literally translated “water of the flowers”—a special alcohol used to clean the person, the space, and the energy. Another cross-cultural aspect of Indigenous ceremony is the use of instruments and sound to call in the spirits to hold space and protect the exchange. Through the use of singing bowls and drums, we are able to drop into an instant state of connection with spirit, breath and nature. We complete the ceremony with a short silent breathing meditation to connect us to each other and the environment around us. Once this is complete, eyes open and we begin the merging production. 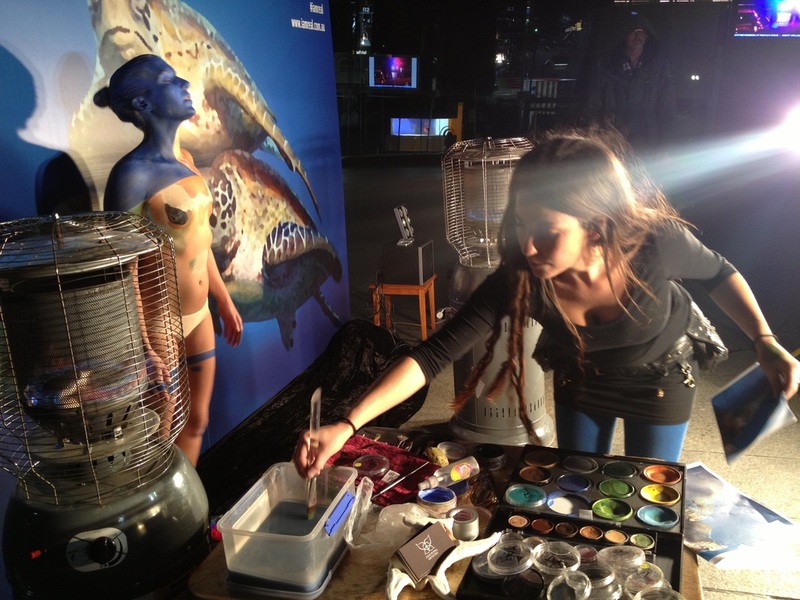 What special skills and materials are required for body painting? Eyes are important but perhaps not in the same way people might imagine. The practice of merging someone into the earth is a “one-eyed” technique, so being able to work through one eye only is essential. I am very short sighted and visually impaired in one eye. This has given me the ability to see the world “impressionistically” and not get caught up in the details. It is the blurring of foreground and background that in fact leads to a blurring of time and space, allowing people to literally merge with the eternal truth of our human existence. A meditating woman is "merged" into a flowering tree. How do you respond to people who dismiss all this as “hippie nonsense”? It doesn’t bother me what people think. I am satisfied with the fact that people have the opportunity to think at all about new ideas and important truths such as the message within all my work, which is that we are part of the planet and have a responsibility to connect with the issue of sustainability and environmental respect. My work is an opportunity for people to dive deep into experiential art therapy. Art therapy has a long standing history of success. Being able to dissolve belief patterns and create cathartic release through creative practice is an ancient technique. I work with all types of people, those familiar with these concepts and those who are new to these ideas. For me this is all an issue of self love, loving ourselves as part of the beautiful planet we were born out of and recognising that our actions and ways of being have an impact upon the whole world. How did you get to this point, and what’s next? Four years ago, in the beginning, I set out to respond to visions that had come through medicinal journeys with a special shamana of 80 years that I had the honour of working with in Peru, Madam Adela. When I originally put the call out, I invited people to be part of the creation of an “art collection,” as I was aspiring to “make it” as an artist and have my first exhibition. I was inundated with people who wanted to be painted into the world, because people resonated with the message of merging with the planet, and the potential healing both of the personal and universal realms that this could facilitate. For the last 2 years all my work has been commissioned. I no longer aspire to exhibit works per se, as I have understood the depth of this experience for everyday people and have responded to the demand for the experience. It’s quite an incredible experience, and the images remain available for the world to see because my ultimate intention of this process is to continuing presenting humanity with a direct visual connection to the message—we are ONE with the earth. The guitar virtuoso weighs in on music as therapy and being Instagram famous.